Home / soaps / When the rain falls in your soap! I love soap challenges and learning new techniques! 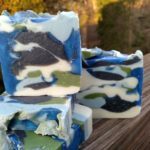 I entered the February Great Cakes Soap Challenge for making a Cold Process / Melt n’ Pour Designed Soap. This was something I had never done before and was up for the challenge. Since St. Patrick’s Day is just around the corner I was looking at a fragrance oil called Kentish Rain, hence the title of this blog post. A wonderful Bramble Berry Scent described as “rainy, salty mist green notes made up of basil, green leaf and ozone notes”. I thought to myself that it was perfect for the occasion. There was a note that it did accelerate trace slightly. In soapy terms this meant that the soap would thicken faster than normal. So I thought bravely, I can deal with this and decided to move forward. I created a color scheme with light blue, dark blue and green micas. I imagined a clear blue M&P soap would add some pretty sparkle to the bars. 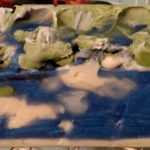 I mixed my batch and drizzled lines of color into the soap as the soap started to thicken up. I ended up glopping ( very technical soapy term) the remaining soap on top to the loaf and made some puddles with the remaining M&P overall. It did thicken faster than I anticipated. When I swirled the soap back and forth to give a more marbled look I ended up pushing the M&P to the sides of the soap loaf. All seemed to be good. I put the batch in the refrigerator to prevent the CP Soap heating up. The resulting heat can make the M&P Soap funky ( another soapmaking term). 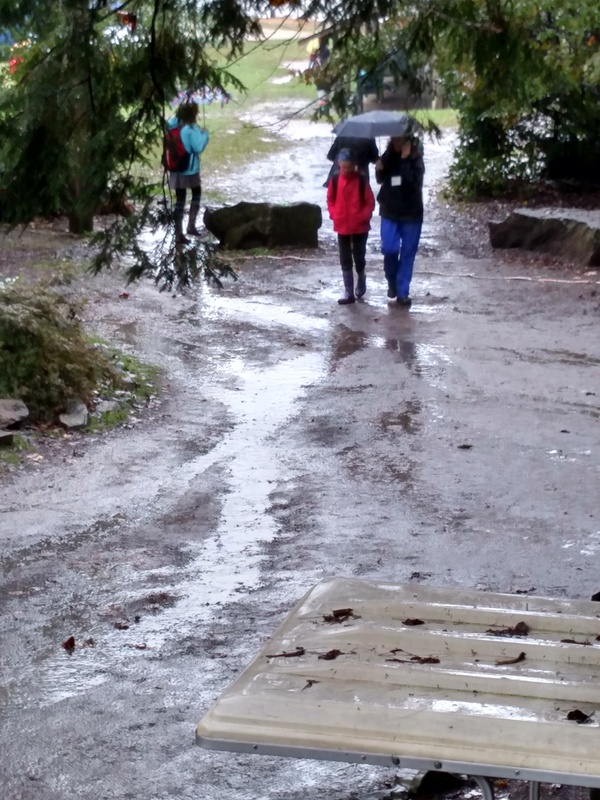 All seemed to be good BUT as they say then the rains came. When I tried to unmold the soap, I could not get my soap out! I tried to slide it out gently and that did not work. So I cleared a spot in my freezer and shoved the whole thing in there. I let the soap sit for 8 hours and let it ponder on getting out of the mold. Usually when you put soap in a freezer it shrinks a bit and pulls away from the side of whatever mold it is in. When it was nice and frosty I took it out of the freezer and pounded the heck out of it. Eureka! It finally moved and I was able to unmold my soapy creation. The M&P had pushed to the side and down and hardened under the paper causing the soap to stick to the wood of my mold. I was kinda disappointed as the M&P portion was mostly all on the outside of the soap loaf but still pretty. I like how the colors look like clouds with the green hills. This is something I want to try again but without swishing it. SO next time I will just let the M&P drop into my soap and let it be as the song goes. I will have this soap on sale in about three weeks under the name Kentish Rain. So check us out !